← Smithtown, New York. January 15th, 2013. A giant sinkhole that swallowed up an SUV has closed a portion of roadway in Smithtown early Tuesday morning. According to police, a 911 call was received indicating that an SUV had driven into the sinkhole. Police said the Suffolk County Water Authority is working on the problem. Mount Pleasant Road remians closed in both directions between Cambridge Road and Daisy Lane in Smithtown. Police said there were no reported injuries. The incident occurred at 3:39 a.m. on Tuesday. 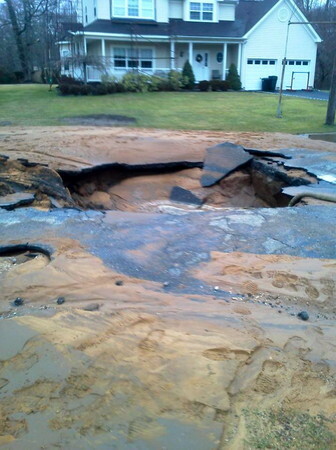 This entry was posted in Pictures and tagged sinkhole, smithtown. Bookmark the permalink.